Region: 30 Miles from Las Vegas, Hoover Dam 5 miles, Lake Mead 4 miles. The historic Boulder Dam Hotel Bed & Breakfast is a charming, unique, Dutch Colonialstyle hotel in the heart of the historic district of clean, green Boulder City. Boulder Dam Hotel is the first Nevada hotel accepted into National Trust Historic Hotels Reflecting Architectural History of America. Tucked away between the glitter of Las Vegas and the awesome wonder of Hoover Dam, you'll find Boulder City, an unexpected oasis of shade trees. parks, golf courses, great restaurants, museums, antiques, unique shops and art galleries. 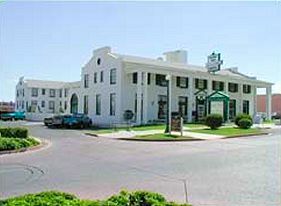 Built in 1933 to accommodate visiting government and corporate project managers supervising the building of Hoover Dam, the Boulder Dam Hotel quickly gained a world wide reputation from a steady flow of dignitaries and celebrities. It was named to the National Register of Historic Places on August 19, 1982. Unlike Las Vegas and other major cities where older hotels are demolished for entertainment, citizens of Boulder City have spent over 8 years in the renovation and restoration of the "grand dame." The Boulder Dam Hotel Bed and Breakfas is once again providing a taste of a bygone era of hotel hospitality for visitors to Boulder City. This and other great Bed and Breakfast Inns can be found here online in The Register.